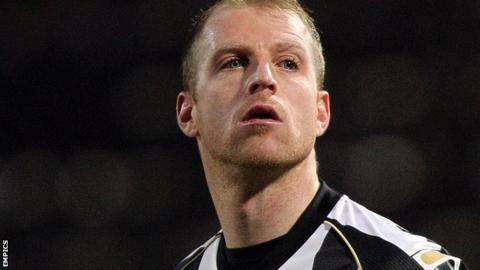 Neal Bishop headed a second-half equaliser for Notts County to keep their faint play-off hopes alive and dent Tranmere's bid for promotion. Abdulai Bell-Baggie had put the home side ahead, racing onto Cole Stockton's pass and firing in a left-footed shot. But Bishop headed in Alan Judge's free-kick to bring County level. Tranmere, who would have gone top if they had held on for victory, lost midfielder Andy Robinson and defender Ian Goodison to injury early on. The home side, who saw Michael O'Halloran and Jean-Louis Akpa Akpro squander early chances, were not helped when their in the first period. Having lost on-loan after the 5-1 success at Colchester, experienced duo Robinson and Goodison were forced off inside the first 25 minutes. But substitute Stockton made an almost instant impact, sending Bell-Baggie through for his second goal of the campaign. Chris Kiwomya's County had a spell of pressure before half-time and plenty of chances before equalising, a header from Jeff Hughes the closest they came to levelling before captain Bishop netted his sixth goal of the season. And they could have snatched all three points, but Hughes was denied by the upright having latched onto Judge's lobbed pass. "We fought and scrapped because they're a good side. "After the goal, we needed to push on from there but we just got a bit nervous and a bit anxious. "But when you lose your two older players - I don't know what we've done just recently with how things have gone against us (with injuries) - give them a pat on the back." "They are a good team and play their system very well. "After they scored there was only one team that would win it. They played on the counter-attack and we were asking all the questions. If we had got the three points I thought that would have been a fair reflection. "Neil Bishop is a good player. He is a good finisher and has good technique. He drives the team forward and can score goals as well."